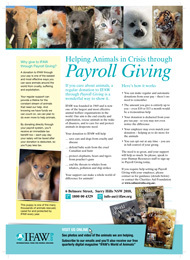 Payroll Giving is a simple and a wonderful way to show much you care for animals. Your payroll giving donation to IFAW will help save cats and dogs from cruelty and disease; defend baby seals from the cruel Canadian seal hunt; protect elephants, bears and tigers from poacher’s guns; protect whales from commercial whaling, pollution and ship strikes…and so much more. The need is so great, and your support will help so much. So please, speak to your Human Resources staff to sign up to Payroll Giving today. If you require help setting up Payroll Giving with your employer, please contact us for guidance (details below) or contact the Charities Aid Foundation at www.cafaustralia.org.au. Download our Payroll Giving leaflet.